I am often confused what to answer when people ask me what my religion is, because I really don’t consider myself to be religious. I usually refer to myself as being Buddhist, but only because from my understanding of its philosophies, I identify well with its principals. I do not participate in the religious aspects so much as I find balanced principals to help guide me through my current existence and perception of self. One religious aspect of my beliefs that I follow and find extremely important is meditation. It has an ability to induce a realignment of the self unlocking the door to a deeper state of relaxation and awareness. Finding balance and maintaining balance are a continuous cycle of adjustment needing regular orientation. Only through regular practice will the power of meditation be there when you need it most. Progress is hardly ever instantaneous. Progress is usually achieved over a period of time surrounded by consistency. As we go through the up and down cycles of time it is impossible to follow true with a direct path. It is more likely that the path we follow will be varied with direction and difficult to visualize the destination especially when we think we are going in circles or going backward. My personal beliefs about meditation are based on my experiences, some guided instruction, background in martial arts, and some independent research. For you this really means nothing. This is more so you can see where I am coming from in the interpretation of my experiences. I believe that meditation or the ability to meditate always starts inside of you. You must first make the commitment to do and not judge what is done. There is no wrong way to begin. The act of beginning is an improvement on the moment before you began. This is a line form Tony Robbins, I think I herd him say it on one of his CD’s or something close. When we were kids first learning to walk did we ever give up? No! Because if we had, then most people would not be walking today. How did we learn to walk, one step at a time. Consistently trying until our legs gained strength and our mind built confidence. With that in mind also understand that meditation in not some kind of regulated procedure where there are all these specific steps to the right outcome. It is the freedom of your mind finding a place where things are more peaceful, pleasant, and clear. With your basic goals of mental and physical betterment experiment with various techniques until you find what works best for you. Every one is different so different things will work for different people. We are also similar in many ways so keep your mind open to things that might work for others. My general routine for meditation is as basic as the process I went through to learn it. 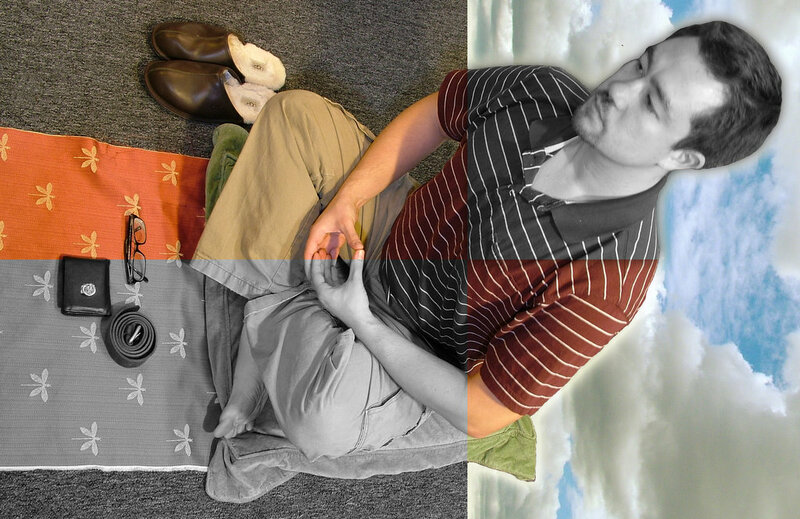 With my limited knowledge I knew that one of the preferred ways to sit while meditating is with your legs crossed and hands relaxed in your lap. I also learned from other experiences it is nice to have some visual element to focus on as well as some soothing music. For music I have tried a few CD’s but the one that has worked best for me is Lifescapes: “Meditations – Native American Flute.” You should try what ever you think is going to help you relax. This one works well for me because I really enjoy the flow of the drum and flute sounds. If you imagine yourself following the music it is like a bird gilding in the sky. For breathing it is good to have long deep breaths slowly in and slowly out. This will also give you something to think about. Some time is could be like a game for you. Trying to see how long you can slowly exhale or trying to be as smooth and consistent on the inhale as you are with the exhale. You will soon see your self begin to relax. Letting all that oxygen absorbed into your body will do wonders for clearing the mind. The feeling of your muscles relaxing will help relieve unwanted tension and stress. Since I did not have a candle on the first day I tried to meditate at home I used the visuals program on my computer and a way to help focus the mind. It is always changing never abruptly and it flows very rhythmically as it follows the music. I usually start in a leg crossed method of sitting. After a while my back starts to hurt so I took a lesson from my weight training and came up with a plan to always start of in a really good form and hold it until it begins to be uncomfortable reevaluate my form and continue until it starts to be disruptive to the meditating process. Once I feel it is time to move the next stage I lay flat on my back with pillow under my head. My hands are rested lightly on my chest. I continuously work on consistency of breathing. I repeat the breathing exercises until I become relaxed. When a random thought or some other interference comes I just go back to focusing on the breathing. It is like a way to re-center the calmness. When I lay on the floor I am not focusing on the visuals any more it is just the music. Then after a while I take off my headphones and just listen to the sounds of silence. It can be a very mindful experience of the present moment. When I have time I just like to meditate until my half open eyes become open and my mind seems to wake form the ultra relaxed state. Since time is not always as plentifully as I would like. I usually listen to three songs on my CD which is about 15 minutes. Meditation can be a very personal learning experience. That dose not mean you should not meditate with others. It just means that I believe that the ability to meditate and the benefits you get form it all depend on what you as an individual put into it. Others can not meditate for you to increase your ability to achieve better meditation. I believe all people have the ability to achieve periods of great meditation. The real challenge to beginning the path to a quality and relaxed state of mind is our ability to be consistent about our efforts. The key element is time. Approaching the experience of meditation as a goal to be committed to by consistency over time and not as an expectation of mastery overnight will free you to achieve balance and find harmony in life. I started this process with the mind of a student and I still have the mind of the student. I am not sure if there is a finite mastery level of meditation, I think it will always be a growing process. You might find some very successful methods to reach a place of relaxation and peace, but they may not work in all situation. Also as life changes you will change and this may call for you to modify your methods of meditation. This playlist features videos that I have created using the Pimped Ad philosophy of promoting things that you like and that are important to me by sharing it socially in a manner that is unique to me. The earliest videos I made in this style were produced in early 2007, but it was not until August of 2007 when I started calling them a Pimped Ad. Please enjoy! Featuring the video creations and promotions that I have made. Crated with the Pimped Ad philosophy of promoting things that you like and that are important to me by sharing it socially in a manner that is unique to me. Please enjoy!